autopsy photos wiki page) The MB would be an OBVIOUS neck shot from behind. This wound is obviously too low to support the MBT. the bullet and left their telltale marks on the wound. Sure seems like a bullet entering below the jacket bunch at the nape would have to go downward to exit at the level of the tie-knot. Seems Kennedy had some "back" below his collars. Sure. Tweezers leave permanent marks on skin. That's a conspiracy kook cartoon. It has nothing to do with how the WC saw the SBT. That's nice. Now show us in the films of the assassination where there's a shirt hanging flat on a hanger. I see why it's best to leave the deduction to the experts. Make that an evidence photo taken at the White House garage. So far, you're battin' a thousand. You mean how you've framed the evidence. How does the bullet miss the spinal column? OK the shirt is all "bunched up" what about the autopsy pic's? Is that all you've got - a pic of his SUIT JACKET? 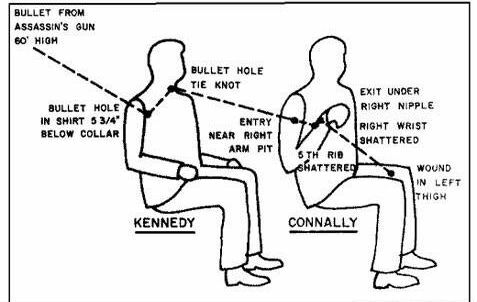 The evidence is absolutely clear that the bullet went through JFK entering his upper back and exiting throat beneath the left side of his neck tie. The question is: what did it strike afterward? Why does the downward path of the bullet not affect the path through the body? If it does, what is the downward angle you are using? How do you factor in the position of JFK (ie. was he perfectly vertical or was he leaning? Which direction and how much? the spinal column and trachea, middle front. What right-to-left angle are you using for the bullet path? It depends on the time of the first shot. If the first shot was at z195 or so, the angle was over 13 degrees. Would you think the bullet has to go through the spine if it was travelling right-to-left at a 13 degree angle and exited the throat, .5 cm left of JFK's midline?